After the summer times, we enter the nostalgia of the sea, you can recycle the sea shells as a decorative element that give a sailor touch to your home. Besides being environmentally friendly, it's something fun and very creative. Since the typical boxes of seashells and figurines, to vases, frames, etc. It depends on your creativity. You can also use the shells of sea shells and other objects of seafaring decoration, you can combine chip sponge, sandy beach or starfish. The idea is not just cut and paste, but look textures and sheens and multiple colors of sea shells and shells. We do not forget that the nacre is one of the most beautiful materials that you can find in jewelry. First thing we do is to clean the shells, shells or stones, whether or polish them in some cases. 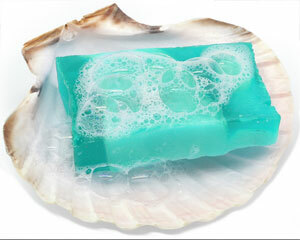 If the shells are very dirty, you can soak them with a little bleach, but be careful not to damage them. Then remove some sparkle, special cloths that can help you, but it will be enough with a little petroleum jelly or mineral oil, and rub with the rag. One of the simplest ideas is to realize a jabonero with a pair of shells, a large, as a large roughly oyster, and other smaller. Most turned face up like a bowl and smaller, which will make kickstand, is engaged below the highest upside down. 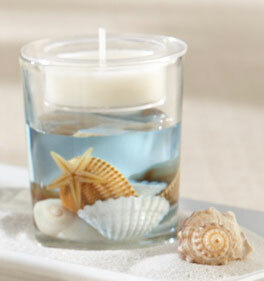 Another way to use the natural conch shells and sea is use as candle holders. You can also use the shells to coat decorative frames, for example you can line the frame of a mirror, a photo frame or a lampshade. If you know ingeniously combine different shells, you can create shapes like a puzzle. The result can range from something simple like a drawing of a flower to more complex figures. For example, our partner Maria has had great patience and created sculptures of fantastic flowers where the shells look like real petals, one by one, placed carefully and art. In this example, after making the figure has been put in glass vases or urns. Jewelry is always on fashion. 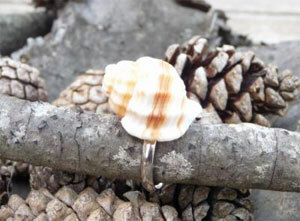 So you always have the option to make a ring or earrings with sea snails or sea shells, even you can also make keychains. 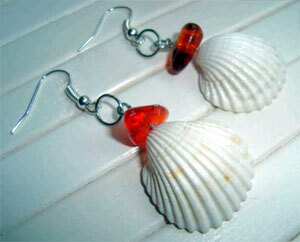 To make earrings, the only secret is to use rods of silver jewelry and piercing shells or shells to introduce the rod. To pierce the shell you can use a small battery-powered drill for these uses and special drills for ceramics. We below sea shell or shell to drill a piece of soft wood, pine for example. You can get the earrings closures at any jewelry store. For rings, it's as simple as with a smooth ring, he will join the inlet or fritters with contact adhesives also recommend using colored glass and other elements that adorn the ring.